Entertaining isn’t what it used to be, not with two little kiddos in the house. But the night of the Oscar Awards is different. Oscar night is glamorous, refined… grown up. On Oscar night, I’m willing to break all of my practical rules for family-friendly entertaining. Well, except for the one about simple cooking. This easy, elegant Oscars party menu – complete with an award-worthy dessert by sweets genius Bakerella – is proof. Don’t worry about setting up a full bar. Instead, keep it simple and glam with a signature cocktail. This give a personalized touch and, more importantly, allows you to make and set out mixers ahead of time. 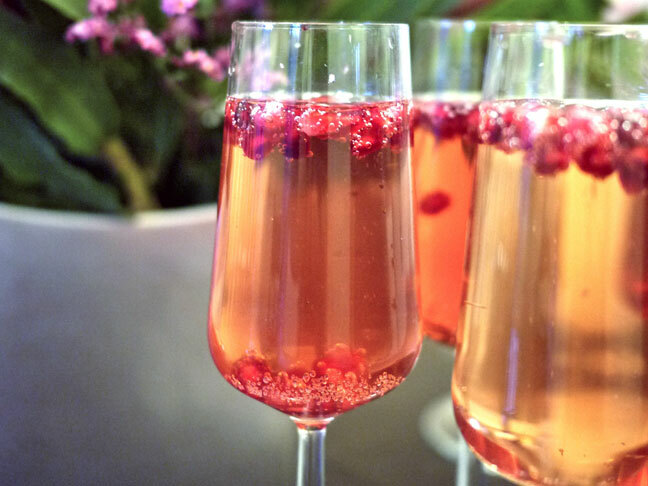 One of my go-to fancy cocktails is this Pomegranate Pear Bellini. 1. Pour pear puree into the bottom of a champagne flute. Top with sparkling wine. Add a splash of pomegranate juice. Drop in a few pomegranate seeds. Galettes – rustic, free form tarts – are one of my favorite simple dishes for entertaining. With rough edges of dough lightheartedly folded over filling, they are at once elegant and easygoing. Roasted butternut squash is my go-to filling through fall and winter. 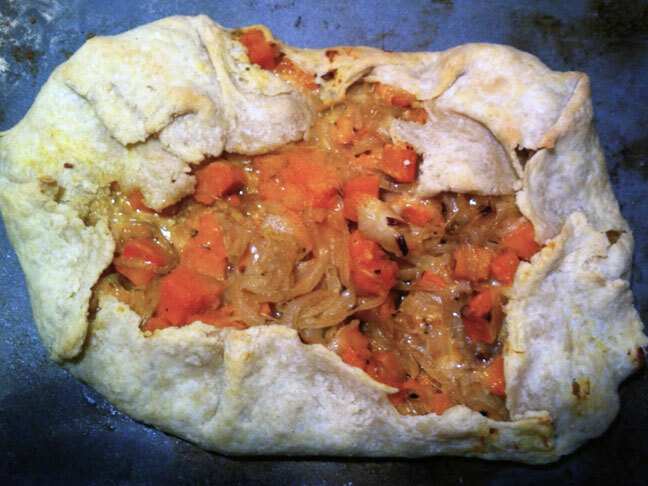 I give this Butternut Squash Galette a glam upgrade by adding caramelized onions and gruyere. Pair this galette, which serves 6, with a simple mixed green salad and, voila, dinner is served. 1. Prepare the dough: Pulse flour, butter and salt in a food processor until the mixture resembles coarse sand. Drizzle ice water into the processor and continue pulsing until the dough just forms a ball. Roll dough into a ball and flatten into a small disc. Wrap in plastic wrap and chill for at least one hour. 2. Prepare the filling: Preheat oven to 375. Toss squash cubes with 2 tablespoons olive oil, thyme, salt and pepper. Roast for about 20 minutes, until the squash is just fork tender. Be careful not to overcook the squash or let it get mushy, since it will cook a little bit more once in the galette. Turn the oven up to 400. 3. While the squash roasts, caramelize the onions. Heat remaining tablespoon of oil and butter in a large, heavy skillet over medium heat. Add onions, salt and pepper and a pinch of sugar. Cook, stirring only occasionally, until the onions turn golden brown. Stir more frequently, but not constantly, as the onions darken further. The onions are done when they are deep brown. This will take about 20 minutes. 4. Assemble the galette: Roll dough into an approximately 12" round on a lightly floured surface and lightly floured rolling pin. Transfer the dough to a lightly oiled baking sheet. Top evenly with roasted squash, leaving a 2 to 3" border of dough. Top the squash with caramelized onions. Top the onions with gruyere. Fold the border of dough over the fillings, overlapping where necessary, creating an edge. 5. Bake galette (in a now 400 degree oven) for 30-40 minutes, until golden brown. Allow to cool for 5 minutes or so, but serve hot. 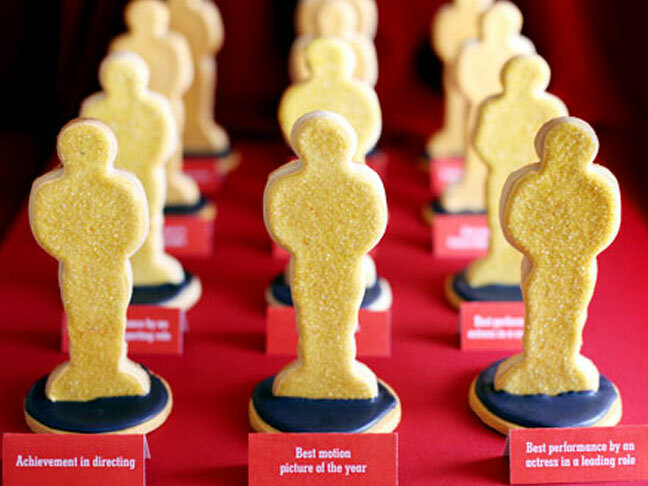 I must admit that these amazing Oscar statue cookies by dessert goddess Bakerella, best known for creating cake pops, are a little work intensive. But they are simply too gorgeous not to share. If you're willing and able to put in some time today, tomorrow or Saturday (you can even break the steps up between all three days), they are so worth it. Just get your favorite sugar cookie dough ready and follow along with Bakerella's easy Oscar statue cookie how-to. See? It really doesn't take much. Glamor and elegance – grown-up style – can come easy with just a little planning and inspiration. Enjoy!